2013 was a good year for equity investors who invested in high quality companies reporting 20-30% + annualized growth. This helped companies to got their due share of re-rating and delivered exceptional returns to the shareholders. 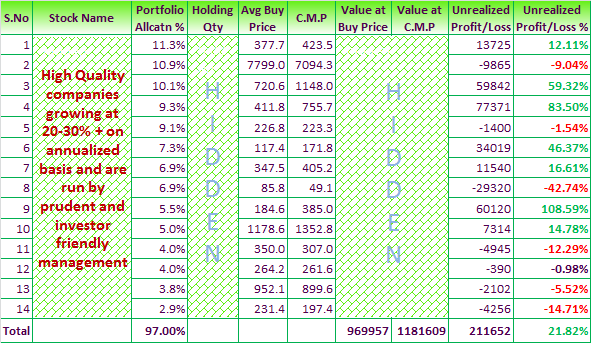 In case you have not already started building a portfolio of high quality and high growth stocks for long term wealth creation, please find below the Wealth-Builder Portfolio allocation for your reference. The same was shared with our Wealth-Builder members recently. We believe, investing in Wealth-Builder portfolio with regular portfolio review from our end can help you achieve market beating and very good returns over a longer term and help you take care of yourself and your family needs, which ultimately lead to a healthy and wealthy life after retirement. In 2013, our Wealth-Builder portfolio has outperformed Nifty and Sensex by wide margin. Since 1st Jan 2013, Nifty has given returns of 5.2%, Sensex returns is 7.6% where as Wealth-Builder portfolio has given returns of 21.8% returns to our members. Absolute Wealth-Builder returns is 18.3% as we booked loss in few of non performing companies during 2013 and added few other stocks in Jan'14. Weatlh-Builder portfolio update has already been mailed to our members. We have total 13 stocks in our Wealth-Builder portfolio as on date. Now, what is good is that the economy seems to have bottomed out, the growth outlook has improved and we are therefore hopeful for a very good 2014 for equity investors. We believe that our selected stocks (will continue to review their performance and make necessary changes when ever required) will continue to deliver more than 20% annualized returns during 2014 also. We have already published Wealth-Builder 10 Lakh Rupee portfolio - Jan'14 and shared it with our Wealth-Builder members on 20th Jan'14. Wealth-Builder subscribers need to replicate our recommended portfolio in exact proportion. For ex: If we recommend to invest Rs 50,000 in “x” company with portfolio allocation of 5% in Rs. 10 lakh portfolio, subscriber starting his portfolio with Rs. 2 lakh need to invest Rs. 10,000 in “x” company with similar portfolio allocation i.e. 5%. Start managing your equity portfolio like a professional, subscribe to Wealth-Builder by paying nominal annual fee of Rs. 15,000 for entire year.